Composed by Nikolay Andreyevich Rimsky-Korsakov (1844-1908). 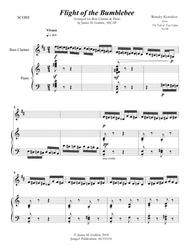 Arranged by James M. Guthrie, ASCAP. Romantic Period, Repertoire, General Instructional, Technique Training, Recital. Score, Set of Parts. 15 pages. Published by jmsgu3 (S0.333131). 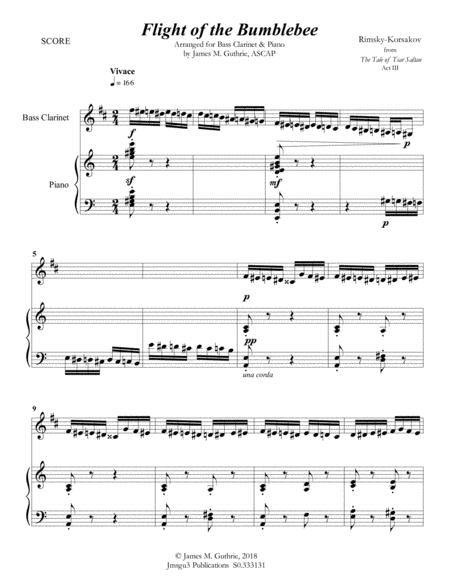 Flight of the Bumblebee from Korsakov's "Tale of Tsar Saltan" Score: 9 pages, Solo part: 3 pages, Piano accompaniment part: 3 pages. Duration: ca. 1:15. Amaze your listeners with this short but stunning recital encore! Flight of the Bumblebee is, to be sure, an orchestral interlude composedby Nikolai Rimsky-Korsakov for his opera The Tale of TsarSaltan. Korsakov, of course, intended to musically portray the chaotic flyingpattern of a bumblebee. Nowadays, this piece is one of the comparatively morefamous classical works because it frequently appears from time to time in popularculture. In the opera, the piece appears notably at the close of Act III,Tableau 1. This is when the magic Swan-Bird, in fact, changes the Prince (the sonof the Tsar) into a bee so he can fly away to visit his father. Interestingly,at this point in the drama, his father, in effect, does not know that he isalive. NikolaiRimsky-Korsakov (1844 –1908) wasa uniquely famous composer from Russia. He was likewise a member of aninfamous assembly of composers called The Five. Korsakov was furthermore anexpert in orchestration. His correspondingly most famous orchestralcompositions—Capriccio Espagnol, the Russian Easter FestivalOverture, and the Scheherazade suite—are important monuments of the standard music repertoire. Also, comparatively very important arehis suites and excerpts from his 15 operas. Korsakov was moreover fond ofusing Russian folklore and fairy tales in his music, such as Scheherazade. Korsakov believed, similarly to fellow outspokencomposer Balakirev, in creating a nationalistic, Russia-centric styleof classical music. The new style was in fact called “Orientalism.” It similarlyrelied on native Russian materials, exotic scales, and experimental harmonic,melodic and rhythmic procedures. This practice, conversely, ran counter to thedevelopments in Western musical culture. Nevertheless, Korsakov developedan appreciation of Western musical techniques after he became a professor ofmusical composition, harmony, and orchestration at the SaintPetersburg Conservatory in 1871. Moreover, he undertook a rigorousthree-year program of self-education and mastered Western methods,incorporating them in conjunction with the influences of Mikhail Glinka andother members of The Five. His techniques of composition and orchestrationwere additionally enriched by his exposure to the works of Richard Wagner. Korsakov combined his music career accordinglywith a career in the Russian military. He was in the first place an officer inthe Russian Navy. In due time, he was appointed as a civilian Inspector ofNaval Bands. As a result, Korsakov expanded his knowledge of woodwind and brass playing,which in turn heightened his capabilities in orchestration. Korsakov in due time contributeda significant number of Russian nationalist works. He also prepared, fromtime to time, compositions by The Five for presentation. This brought their worksstraightaway into the active classical repertoire as well. He also shaped anentire generation of younger composers during his time as a music educator. Therefore,music historians consider Korsakov as the foremost engineer of what the public considersto be the Russian style of composition. He served, all in all, as atransitional figure between The Five and the classically trained composers whobecame the norm over time. In addition to the Russians, he forthwith influencednon-Russian composers such as Ravel, Debussy, Dukas, and Respighi.